New York: With the prospect of a government shutdown looming this Friday, US President Donald Trump is turning once again to the politics of fear and “paranoia” that catapulted him to power, suggesting that Americans should all be living in a sense of profound dread as long as concrete isn’t poured into a wall along the US-Mexico border and that a ‘national emergency’ is business as usual. Trump’s border wall is his signature pledge to American voters that is threatening to become a totem for the US president’s unfulfilled promises. He heads to the dusty desert town of El Paso in Texas tonight to rally his voters on his ‘American carnage’ theme that he says drives his base ‘nuts’. “President is on sound legal ground to declare a National Emergency. There have been 58 National Emergencies declared since the law was enacted in 1976, and 31 right now that are currently active, so this is hardly unprecedented”, Trump tweeted, quoting a Republican Congressman. “Trump will create a circus of fear and paranoia about immigration and don’t believe it”, Trump’s potential opponents are telling supporters because they know exactly where this is going. 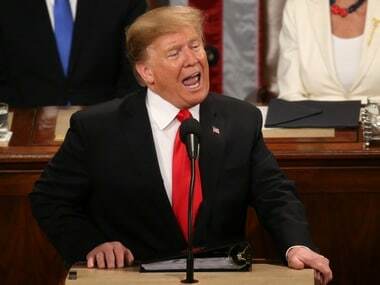 After all the hot air in his alliteration-littered State of the Union speech which meandered from World War 2 to the moon and back to dark prophecies about illegal immigration, Trump is firmly back where he wants to be: partisan battleground. Many in this Texas city of dusty desert winds bristle at the prospect of their home becoming a border wall poster child. O’Rourke will help lead a Monday evening march opposing the wall with dozens of local civic, human rights and Hispanic groups at the same time Trump is holding his rally. Organizers expect thousands to turn out. Republicans are worried that Stephen Miller, the firebrand immigration hawk in the White House, is going to convince Trump to back off from any deal that doesn’t include wall funding. Walking the party off a cliff is a seductive idea that keeps repeating itself in many storylines that have played out in this current White House. “Give him a bamboo curtain, tell him it’s a wall and he’ll take it and sell it to his base as the exact wall he promised”, said Charlie Sykes of The Bulwark about Trump’s use of the wall’s power as visual imagery rather than reality. Democrats are pushing for 16,500 detention beds for people detained in the U.S. They think this is a good tactic to turn the focus on the Trump administration’s interior enforcement policies. Republicans say this will allow criminals to prowl around freely; they want undocumented immigrants who commit crimes in the U.S. to be exempt from the 16,500 cap and Democrats disagree with this. This is a fundamental disagreement in the talks. How much to spend on border barriers and where such structures will go is also being debated. This is December once more. Democratic and Republican negotiators are meeting Monday in a last-ditch effort to salvage faltering government funding talks amid a raging debate over immigration policy. If talks fail, Congress and the White House will need to assess fallback options to avoid another shutdown.